Whilst we may not agree on everything, one thing is almost unanimous: the classic bacon sandwich. Here’s our take on the perfect sarnie. The bacon sandwich is something of a national institution in the UK You may well have your own thoughts on the perfect way to craft a bacon sarnie, from the best condiment to accompany it or whether it should be mixed with sausages, eggs or simply be kept as a solo act. However, nobody can deny the greatness and the ability to bring people together like a delicious bacon butty. Yes, there are more complex bacon recipe ideas out there but regardless of age, gender or position in life, most people can agree on a bacon sandwich. From peckish children, OAP’s, greedy teenagers or Dads at a football match, the bacon butty remains tried and true. Everyone has a personal preference for putting together their perfect sarnie, for us at least, is about simplicity. Using the highest quality ingredients is the key to getting your bacon sandwich just right. When it comes to bacon there are arguments for back bacon and there are those that prefer streaky bacon. We think that back bacon is the choice to go for but luckily for you, being a bacon wholesaler, we offer a full range of bacon cuts to choose from. We like to go for a smoked option but we have something for everyone. The battle doesn’t end there. How you cook the bacon is where the war on flavour is won. The traditional method of cooking your bacon, at least for many is in a frying pan. However, another way is to use the grill for a crisper slice of bacon. You can use this method by rubbing both a pan and the bacon with a drizzle of olive oil and let the bacon go nice and crispy. As it crisps up and starts to curl a pool of bacon juice collects. Perfect. No arguments here on the type of slice you should use, a good quality white bread is without doubt the right call, preferably a tin loaf too. Some people prefer a bloomer but we like to keep things simple. A white loaf holds everything together a little better and in our opinion just works. You can either add a bit of butter to the bread, the traditional method. But our secret is to push the bacon to the side of the pan and let the bread soak up some of the juice from the pan and forgo the butter. Of course we’ve seen something of a sea change in recent years with people trying all sorts of alternatives to reinvent the classic bacon sandwich. Crunchy rolls, ciabattas and even sourdough options being used. Others look for gluten free bread or search out for the best healthy bread options to minimise carbs. When it comes to a bacon sandwich we think that it’s a time to indulge and really enjoy yourself. This brings us on nicely to the big question. Should you toast the bread or not? Again, a personal preference with no right or wrong answer. 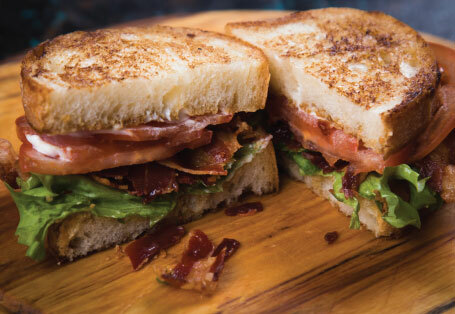 Some prefer to keep the bread soft allowing the sandwich to have a combination of textures, from the soft white bread to the crisp of the salty bacon. However, we know many others, that prefer there bacon in between two slices of toast. For something a bit different why not try adding the bacon to the bread once buttered, put it all together and then add it back to the pan to lightly toast in the mixture of oil and bacon juice before serving. If you prefer to have a bit of crunch from your bread, with some real depth of flavour this could be the way to go. This is where friendships can be broken. Tread lightly. We’re a group of Essex boys and girls so we are a little biased towards a good helping of HP Brown Sauce. But since we’ve been in this business since 1972, believe us when we say that we’ve heard it all. The obvious alternative is tomato ketchup but we’ve heard of tomato ketchup, mustard and green chilli sauce being used together, in one sandwich! It’s not the tradition but if it works for you, why not give it a go. As is the way with many things in life, somethings can’t be explained and personal choice makes for some strange combinations. Bacon and marmalade? We’ve heard of more than one person championing this combination. Apple sauce and bacon? Yep, we’ve seen it all. Fortunately, we provide a wide range of sauces, some that would certainly work better than others for a good bacon sandwich. There it is. The best bacon sandwich, Yes, it’s simple, yes, it’s straightforward. But the best things in life should be uncomplicated and easy to put together. We really think this is the best bacon sandwich. If you are in the food or hospitality industry and are looking to give your customers the perfect bacon sandwich too speak to J.Buckland. Send us an enquiry to speak with our team of bacon experts in Essex or give us a call on 01258 966056.